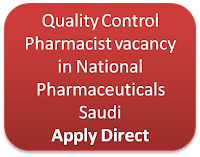 One of our most respected Gentleman Pharmacist ( https://www.facebook.com/mohamed.eliyas.125) , who is now in a very prominent profession informed us through Facebook about a vacancy of Quality Control Pharmacist in National Pharmaceuticals Company Saudi Arabia. 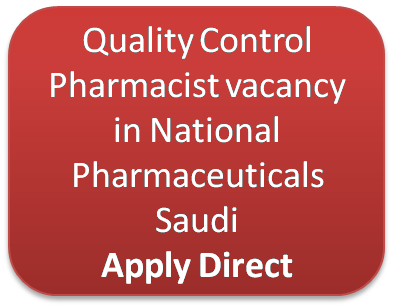 You may directly contact to know more about the vacancy, type of the job and other details. You must confirm the genuinity, quality, and validity of the contract of the company by yourself please. According to him, the following are the details. Experience:min two years exp,should hav knowledge to operate all instruments and should be aware about to prepare test procedures and specifications,also the job is not limited as designation.